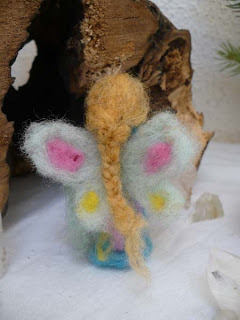 i have just recently started getting back into needle felting. 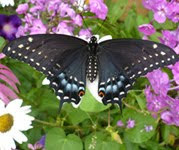 i am eager for spring, and eager to begin setting up my spring nature table. Sage is at the age where she really enjoys playing with the acorn faires and little felt people i've created over the last few years. Unfortunately she is also rather rough on them, pulling off the acorn caps and gnome beards. So i wanted to make a few new faeries and nature folk for my table. This little gnome was heavily inspired by one i saw from Enchanted Gypsy. 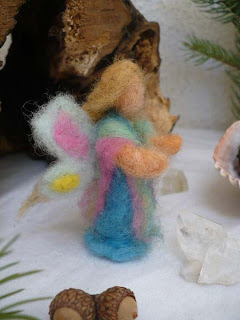 This mama makes the most amazing felted creations. 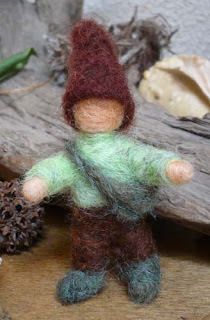 This little gnome is the first thing i have ever needle felted. i am quite proud of him. However, after finishing him i took a break and didn't felt again for quite some time. Yesterday i decided i needed some figures for my table, and so i began this faerie. i still need to put a bit more work into her, but i like that her dress is lightly felted and flowy. 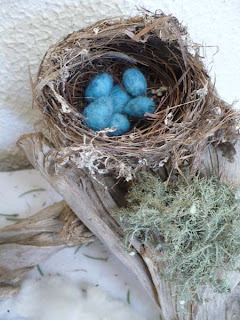 i also felted these eggs to put in our birds nest. The nest spent the winter empty, i am probably a bit early...but i like seeing it full of eggs. i am not ready to take down my winter table, but am slowly transitioning to spring. 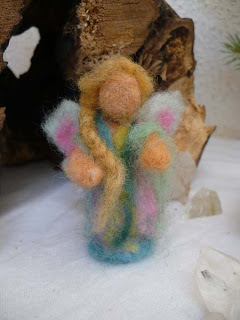 i forgot how much i enjoyed the felting, and can not wait to see what other magic folks and things are hiding in the wool, just waiting to be found. 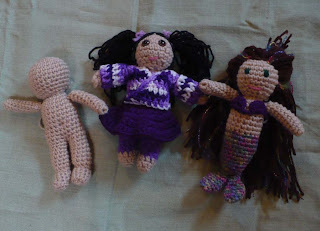 This weekend, i could not resist making more mermaids! This gal is a bit more petite and short waisted. She has cream, light blue, purple a mossy colored green in her tail and dark green eyes. Her hair is a wild curly mess of purple and shimmery blue mohair. The purple yarn began to fray the minute i cut it, so i had to put knots at the end of each strand to keep it from totally frizzing out. i left a few with out the knots, and really like the way she turned out. So now i must name them. Any suggestions? 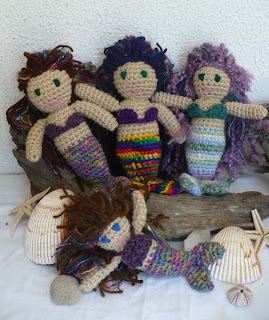 What are some good mermaid names?...besides the obvious, Ariel and Oceana. Leave me a comment and let me know, i would love to hear some feedback! These should eventually make their way to Etsy. 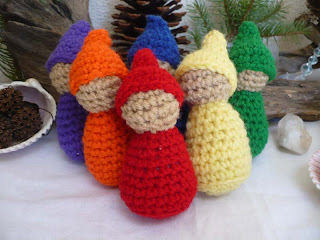 These little gnomes came to be, in a very round about way. 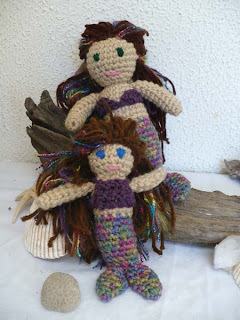 i was actually crocheting mermaids, but i miscounted the stitches in one of the tail fins. i was just about to pull the stitches out, when i realized it looked an awful lot like a gnome hat. :) i am a sucker for gnomes, ya know. So i put it aside with the intention of coming back to it. 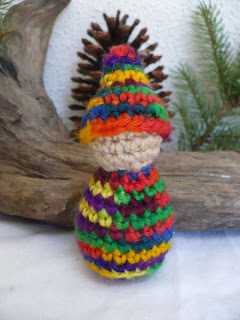 i eventually picked it and began to crochet a gnome to go with the hat. i wanted to make something simple, and was expecting him to have a flat bottom. However, once i added stuffing he quickly took on this bowling pin shape. Seriously, how could you make just one? These were so much fun to make! They measure about 4" tall. If i can ever get Sage to stop claiming them i will probably offer some sets for sale. i was thinking it would fun to offer them as gift sets in a small applique'd tote bag or basket. 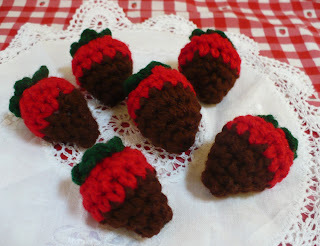 This week i have been crocheting up a storm! Now i just need to get these listed on my site and on etsy. i love the crafting part, but i don't always love the picture taking/editing, computer and sales part. i decided to finally finish a doll i had started many months ago. Her body was complete, but she needed hair and a smile and clothing. i think i'll call her Nina. She is wearing a wrap style sweater and purple skirt. i'm planning to embroider a few flowers or vines on the skirt. Once i have a few better pictures taken, i'll get her listed. 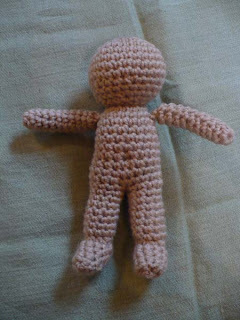 i also started a new doll, with the intention of improving the body shape of my previous dolls. This new style has feet! i am also looking forward to putting the hair on differently. 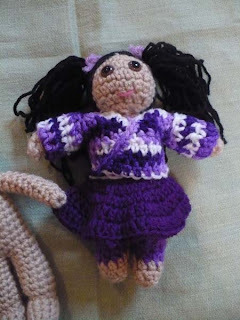 i'll be using the same technique i used with the waldorf doll i made Sage. 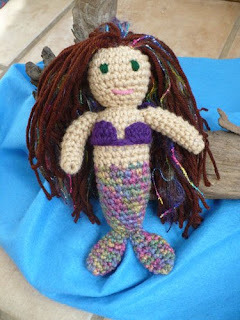 So this new doll with have a big crazy head full of hair, similar to the mermaid. Hats! Yes, it is an addiction. 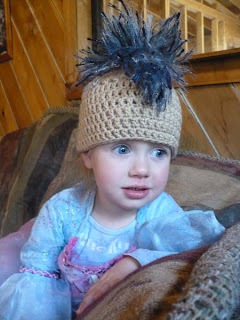 i love to make hats!! So after clearancing off all of last years hats, i am stocking up again. The mohawks are always a favorite, so i am finally getting around to making some more and getting them listed soon. 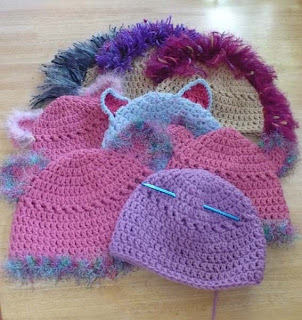 i also have several kitty ear and fuzzy fox ear hats. After cleaning out my hat stock, it will not be long before i am completely over loaded with hats again! These, as well as a few others will be listed on my site sometime this week. 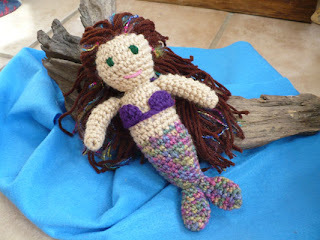 This weekend i decided i just had to crochet a mermaid. 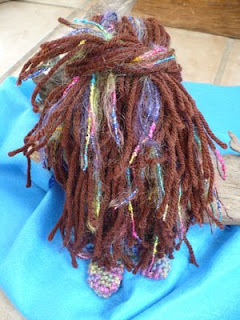 Recently, Sage has been carrying around and playing with several of the rag dolls i have made her in the past. 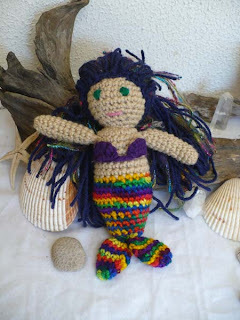 One of them being a lovely mermaid doll. 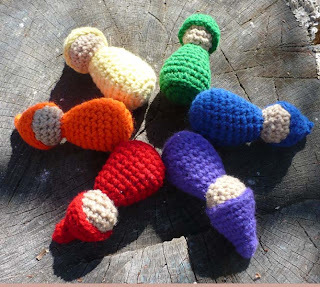 So, that is where i got it in my head, that i must crochet one! 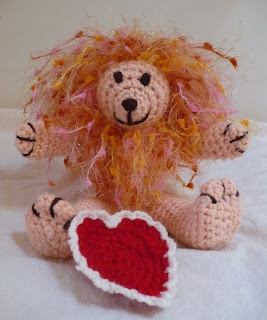 i really like to make crocheted doll and critters and such...and this is just one of those things i absolutely had to make. Her hair came out great! It is really full and wild and out of control. i have some rainbow mohair mixed in that has a bit of glitter in it. So although you can't see it from the pictures, it has some sparkle to it. i absolutely adore her. i am still undecided on whether to list her or not, Sage seems to think i made it for her. 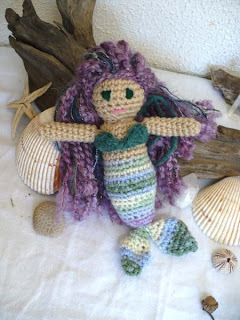 :) Oh well, i've already started a second one, and before i'm over making mermaids i am sure Sage will have a mermaid of her very own. 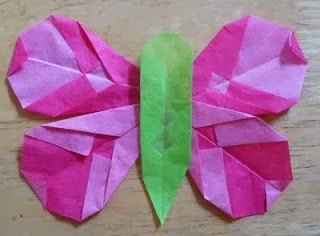 i am trying to get back into the crafty swing of things, and am hoping that blogging it will help to keep me motivated. :) So between changing/washing diapers, folding laundry and chasing a very busy 2 year around... this is what i have been up to lately. Lots and lots of crocheting. This sandwich was a custom order for Debby at Earthtone creations. She makes fabulous reusable sandwich wrappers. 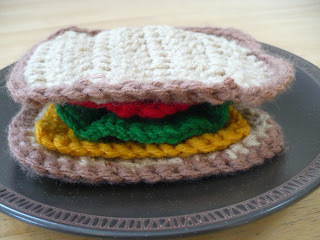 She wanted a crocheted sandwich that she could display with her wrappers. These were just for fun, as i was feeling in the spirit for Valentine's day. Chocolate covered Strawberry play food and a cute little lion i named Leopold. i have them both listed on etsy. i am also just starting to work on a custom Chinese Waldorf style doll for a local friend. i'm still in the thinking process of this one, and will post pictures once i start actually working on. Kenan has been busy making marbles for a private dealer, and is now working on filling a wholesale order for a customer in Japan. Here are a few examples of the marbles he recently sent out. 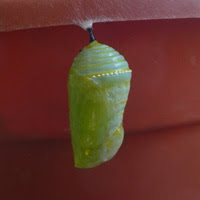 i love to help promote independent artists, WAHMs and organic/eco friendly products. i am always looking for new products to try! i'm always happy to accept product submissions for review or giveaway, but i prefer them to be family friendly and environmentally safe. All requests will be taken into consideration, however I cannot guarantee that i'll review/feature your product. 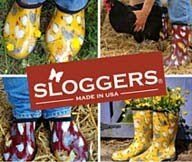 i will respond to all requests letting you know if your product is something that fits for this blog. thanks! Please fill out the form to contact me! i try my best to answer all emails, but it may take a day or two before i get back with you. 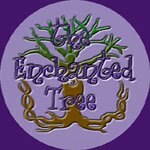 This email form is a new thing, so if you prefer my regular email you can send your message to enchantedtree (at) hotmail.com. Thank you!